This is a great book for anyone who wants to progress to an advanced level without reading music and suitable for all ages. Please click on the image to the right for more details. 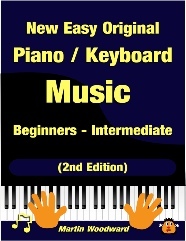 This is a great piano / keyboard book for absolute beginners who want to learn to read music and want the information ‘spoon fed’.with loads of musical graphics Suitable for all ages. Please click on the image above for more details. 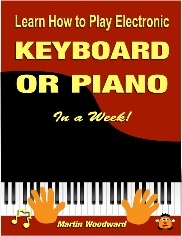 Learn How to Play Electronic Keyboard / Piano in a Week! 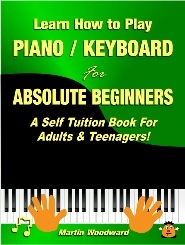 This is a great piano / keyboard book for absolute beginners who want to learn to read music quickly and easily. This is more in depth than the last book and was updated in September 2017. Without doubt my best work! 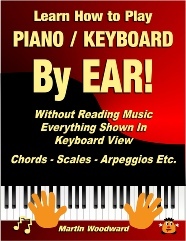 This book contains a great medley of original piano / keyboard music ranging from very easy to a little more advanced. All of the piano pieces can be heard on the site before you buy. These pieces are unique to this site. These Please click on the image to the right for more details. This book contains everything that you need to know about piano / keyboard chords including the circle of 5ths and how piano chords are constructed, as well as just about every piano chord that you will ever need. This book contains everything that you need to know about piano / keyboard scales including major, minor, pentatonic and blues scales. 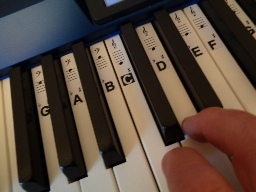 And every arpeggio in every key in both notation and keyboard view. This is a great piano / keyboard book for absolute beginners who want to learn to read music and want the information ‘spoon fed’ with loads of graphics and added humour. Ideal for children or sill adults. 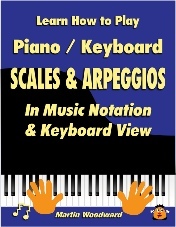 These brilliant removable piano / keyboard identity stickers help you learn to read piano music more quickly and come with my Piano Scales eBook FREE. 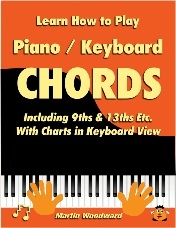 Welcome to learn-keyboard.co.uk where you’ll find a great selection of piano / keyboard books and other learning aids as well as some easy to play original piano music books available in print or digital downloads. Learning to play the piano could be easier than you may think and is possible for everyone regardless of age. There is something herein for everyone whether you want to play by ear or read piano music, or play piano / keyboard in a band etc. Have a look at the scrolling gallery below and simply click on any piano book that interests you or go direct to the products page to see them all at a glance. Most items have a FREE downloadable sample with NO STRINGS ATTACHED so you can try before you buy! Feel free to contact me if you need further information, I am a normal friendly person, very approachable and always happy to help.